This piece was painted plein air in the afternoon when the sun was softly touching the building. The little historic BC Mills House is located in Lynn Headwaters Regional Park. It was originally bought as a prefab from the BC Mills Timber and Trading Co. catalogue. The little home was built in 1908 by Captain Henry Pybus for his family. The BC Mills home was moved into the park as a means of preservation. Hi Elizabeth, I have a question re the BC Mills House painting. Please would you get in touch with me by email? 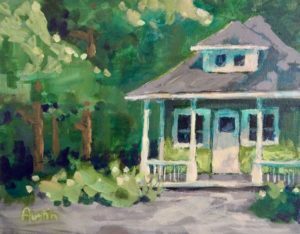 What would you like to know about the BC Mills House painting? I am happy to provide you with any information.